And what the hell was Kid thinking? I like Jamele. She's one of the most fun & knowledgeable sports commentators on ESPN. Is she correct about her comments regarding the acting president of the divided states? Well, he's certainly racist adjacent. That is, I think she's right about him surrounding himself with white supremacists. Regarding him being elected because he's white, she's basically agreeing with Ta-Nehisi Coates, The First White President. And again, I think they're both right. If those humorous promotional television ads earlier this year for SC6 as an indicator of Ms. Hill's character is accurate, she's Black and she's proud [read: pro-Black]. The best of the batch is the one television ad where she costumes like RUN DMC, and Angela Davis, which I cannot find online. 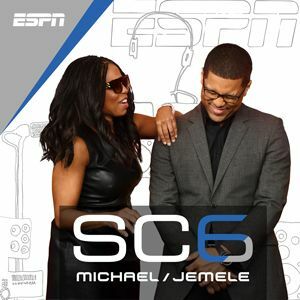 SC6 - "It Takes two"
Jamele Hill's comments are consistent with how everyone else feels about this imposter inside the Executive's Mansion and ESPN understands this as well. Great article by Ta-Nehisi Coates, by the way. When someone hurls an insult at another by referring to them as, "...sonavabitch...!" they're really talking about your mother. Jemele Hill will be a guest on MSNBC's Politics Nation hosted by Rev. Al Sharpton to talk about her departure from ESPN. Met her...both of them, at the Image Awards. Cool people. Hill, who left ESPN at the end of last month, confirmed the news Wednesday to The Hollywood Reporter, which added that it would be her first job since departing the network. The three-part documentary series is scheduled to debut on Showtime in November. 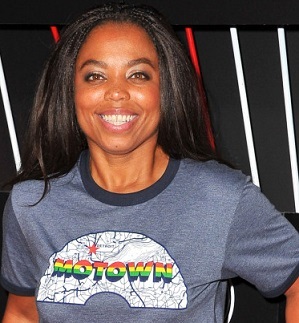 (NEW YORK) — Jemele Hill has moved on, but not from speaking her mind. The former ESPN host, best known to the non-sports world for tweets about the acting-president that provoked the Executive Mansion to unsuccessfully seek her firing, launches a weekly podcast Monday on Spotify. On the show, "Jemele Hill is Unbothered," she'll conduct interviews and give commentary on sports, politics and culture. Coupled with a regular gig writing for The Atlantic magazine and her engagement in December to writer Ian Wallace, the 43-year-old Hill does seems unbothered. Some of her recent Atlantic pieces seem to give a road map for her podcast. She's written about how NFL players need to look out for their own interests because their teams probably won't, a "force field" erected by the Black community that protected singer R. Kelly from consequences related to his behavior and how — after watching Barack and Michelle Obama interact with Trump at the funeral for dubya — she wished they wouldn't always "go high." "The beauty of sports is that it always provided a platform to talk about all of these other things," she said. "We've always made the mistake of making it seem like the rest of the universe is happening in one place and sports is happening over here, when often sports, politics, social media and entertainment have been entwined. It's really not all that big of a leap." Hill became a newspaper sports columnist at 28 and when first hired at ESPN, it was as a writer, not a television host. Hill joined ESPN in 2006 from the Orlando Sentinel. She eventually moved in front of the cameras, although her highest-profile assignment, the 6 p.m. "SportsCenter" with Michael Smith, didn't quite click with viewers. Her Twitter battle with drumphf unfolded in September 2017. She called him a white supremacist and "the most ignorant, offensive president of my lifetime." "pss-s-st... She's right!" ESPN distanced itself from her comments and the controversy that ensued, but didn't discipline her. A month later, she was suspended for violating social media policy for tweeting that fans should effectively boycott the advertisers of the Dallas Cowboys after owner Jerry Jones said players who disrespected the American flag would not play on his team. A year and a half after the incident, Hill said she had no qualms over taking on the acting-president. "I didn't like the fact that it caused damage to people I care about and to relationships that I built, but in terms of what I said, I don't regret it," she said. "In my mind, I've only been proven right so it's hard for me to regret it knowing that I'm on the right side of history." Hill's eventual exit from ESPN was more amicable than these things normally are. She explored some of these feelings in an Atlantic column about reconnecting with John Skipper, the former ESPN boss who left his job because of substance abuse issues. "I left ESPN a better journalist than when I started there," Hill wrote. "I'm rooting for his success because he so heavily invested in mine." Her hiring at Spotify dovetails with that company's ambition to be the world's leading audio platform for both podcasts and music, said Courtney Holt, head of Spotify Studios. The science podcast Dope Labs and another by comic Amy Schumer are among the 20 original podcasts Spotify is making now or launching. "I have always been a huge fan of Jemele," Holt said via email. "She is an important voice in sports, race, culture and politics, and their intersection in media." One guest she wouldn't be interested in having on her podcast is drumphf, not that it would be likely to happen anyway. "He's had no desire to really move the conversation," she said. "There are people who you disagree with who you can have a good conversation with because both parties come into it wanting to be 10 percent closer. That's not the spirit of what he does, ever."